Even younger generations like us are much under equipped to compete with the robots that we build. When jobs are at risk of vanishing entirely, and is happening at a pace that far exceeds what any society can keep up with, a slow burning depression is likely to set in. Most current education systems are not equipped to train students for a robotized and highly digitized world. We all know what the issue is, but no one has the ability to change the direction the broader society is heading in. So will politicians and central planners dabble with the risk of upsetting the status quo for a potential change in direction? Unlikely. Setting up such a change takes years if not decades, far exceeding even the longest of terms in office. As political leaders come and go, so do their policies and advocates. It is therefore almost impossible to effect preemptive change before real harm has been inflicted. As such Bill Gross believes that the Fed will revert back to QE and lower interest rates sometime in 2017, and the reintroduction of fiscal stimuli (something that could very well happen if Trump is elected into the White House). The music won't be allowed to stop. Will we ever see the modern day equivalent of Helicopter Money? A respected reporter recently asked me what were a few important things I had learned from all this and all of that during the past decade and I surprised myself and perhaps him by answering that I now realized that younger generations – the Xers and Millenials – were far different generations from my own. “How so?” he asked. They are ephemerally connected as opposed to hardwired, I replied. They hold history less dear and appreciate freshly baked inclusiveness more; they are inclined to move on instead of settle and build, perhaps because employer loyalty has weakened as well; they are more temporary residents than architects. But they are the future. The challenge for me as a Boomer, I said, was to understand this, yet not sacrifice my generation’s heritage that had made these evolving differences possible. This generation gap, I continued, was just that – a far distance from one side of a chasm to the other. And yet, I thought, (having concluded the interview) culturally we were much the same: making positive, sometimes obsessive contributions at work; loving our families, our pets. No chasm there to bridge. A common culture. But common cultures themselves morph and sometimes quickly so, producing substantial gaps from one figurative day to the next. Most humans who walked this Earth were alive inside a culture that was constant for centuries, yet now it seemed that technology was mutating standards like a cytoplast or perhaps at worst – a cancer cell. Who could say whether this new life form was positive or negative? Who could say that an older generation was any less an ideal than the succeeding one? My experience of the divide between Boomers and Xers is like that; I recognize that youth will be served, but not always for the better. Yet, if I (you) understood that to be somewhat true, what should I (you) do differently? How to live a life – this Shakespearian brief candle? Should I listen to the beat of a bass drum instead of an ancient tom-tom? Would I dare dance to strange new music with a different step? “Forward” is my futile response. Forward – with difficult questions. John Denver expressed it succinctly, “If there’s an answer, it’s just that it’s just that way”. Change propels economies as well as cultures, and sometimes before we are even aware of it. We listen to Trump and Bernie, then Cruz and Hillary as if one of them might be the mythical Wizard of Oz, guiding us down that yellow brick road to reinvigorate growth. They all try to emulate the Wizard of course. “Change you can believe in” was Obama’s mantra and then there was Clinton’s “I come from a city called Hope” and so on. Eisenhower was probably the last honest politician. “I like Ike” was his promise for the future, and I think many voters actually did – like Ike. But back then and certainly now, it was the economy that was changing, not politicians’ promises for a better future, and government policies usually took years to respond. If Thatcher and Reagan sparked a “revolution” of tax policy, it was a long lagged response to decades of growth constricting government policies. If the Great Recession exposed holes in those free market ideologies, then to my way of thinking, seven years of Obama have not yet addressed the cracks in our global financial system. Our economy has changed, but voters and their elected representatives don’t seem to know what’s really wrong. They shout: (1) build a wall, (2) balance the budget, (3) foot the bill for college, or (4) make free trade less free. “That will fix it” they discordantly proclaim, and after November’s election some unlucky soul may do one or more of the above in an effort to make things better. Similar battles are being fought everywhere. Brazil and Venezuela approaching depression’s edge; leftist and right-wing government elections in Euroland; Spain without a government; Brexit; China’s ever-changing five year plan; Japan’s obsessional quest for 2% inflation. “Fix it, fix it, restore our hope for a better future”, beats the world’s tom-tom. Or is it a bass drum? It’s loud, whichever generational beat you dance to. But here’s the thing. No one in 2016 is really addressing the future as we are likely to experience it, and while that future has significant structural headwinds influenced by too much debt and an aging demographic, another heavy gust merits little attention on the political stump. I speak in this Outlook to information technology and the robotization of our future global economy. Virtually every industry in existence is likely to become less labor-intensive in future years as new technology is assimilated into existing business models. Transportation is a visible example as computer driven vehicles soon will displace many truckers and bus/taxi drivers. Millions of jobs will be lost over the next 10-15 years. But medicine, manufacturing and even service intensive jobs are at risk. Investment managers too! Not only blue collar but now white collar professionals are being threatened by technological change. Nobel Prize winning economist Michael Spence wrote in 2014 that “should the digital revolution continue…The structure of the modern economy and the role of work itself may need to be rethought.” The role of work? Sounds like code for fewer jobs to me. And if so, as author Andy Stern writes in Raising the Floor, a policymaker – a future President or Prime Minister – must recognize that existing government policies have “built a whole social infrastructure based on the concept of a job, and that concept does not work anymore.” In other words, if income goes to technological robots whatever the form, instead of human beings, our culture will change and if so policies must adapt to those changes. As visual proof of this structural change, look at Chart I showing U.S. employment/population ratios over the past several decades. See a trend there? 78% of the eligible workforce between 25 and 54 years old is now working as opposed to 82% at the peak in 2000. That seems small but it’s really huge. We’re talking 6 million fewer jobs. Do you think it’s because Millenials just like to live with their parents and play video games all day? I think not. Technology and robotization are changing the world for the better but those trends are not creating many quality jobs. Our new age economy – especially that of developed nations with aging demographics – is gradually putting more and more people out of work. What should the policy response be? Retraining and education sound practical and are at the head of every politician’s promised ticket for the yellow brick road, but to be honest folks, I doubt that much of it will be worth the expense. Four years of college for everyone might better prepare them to be a contestant on Jeopardy, but I doubt it’ll create more growth; for the Universities perhaps, but not many good jobs for the students. Instead we should spend money where it’s needed most – our collapsing infrastructure for instance, health care for an aging generation and perhaps on a revolutionary new idea called UBI – Universal Basic Income. If more and more workers are going to be displaced by robots, then they will need money to live on, will they not? And if that strikes you as a form of socialism, I would suggest we get used to it. Even Donald Trump claims he won’t leave anyone out on the street – a liberal Republican thought if there ever was one. And they are on the street you know. Check out any major downtown in the U.S. if you want to see our future culture. Not the stadiums with the box seats; the streets with the tents and grocery carts. But the concept of UBI is not really new or foreign to capitalistic cultures like that of the U.S. We already have sort of a UBI floor. It’s called food stamps and the earned-income tax credit, but those alone will not keep the growing jobless and homeless off city and suburban streets. The question is how high this UBI should be and how to pay for it, not whether it’s coming in the next decade. It is. Strangely, the concept is endorsed more by conservatives than liberals and in Silicon Valley as well. Even with a theoretical $10,000 UBI per eligible citizen, the cost of $1-2 trillion dollars is seen as an income pool to consume many of the high tech products they produce. Higher taxes are one way to pay for it, but let me suggest another – something that a Rand Paul or father Ron would have been good at. Drop the money from helicopters. Now, even though this idea sounds more fictional than Trump’s 15 foot wall, it really isn’t. Milton Friedman, then Ben Bernanke and now a host of respected economists including the conservative Economist magazine itself are introducing the idea. These advocates do not really intend to throw money out of choppers. In broader terms, they are advocating fiscal stimulus but stimulus that isn’t paid for with private borrowing or taxes. That last sentence is critical – “not with private borrowing or taxes”. Democrats and Republicans alike can endorse that. Instead, the money can be printed by central banks as it has been recently. It’s a hard concept to understand and that’s why politicians never discuss it – nor do most central bankers, who want to preserve the sanctity of their “balance sheets” and independence of their institutions. But the independence between central banks and government is rapidly eroding – a new culture is forming if only by necessity. Printing money via QE is in effect a comingling of monetary and fiscal policy, of central bank and treasury. The Fed, the ECB, BOJ and BOE have in effect bought bonds from their treasuries for 6 years now in order to allow them to spend money in support of their sagging economies. They buy the bonds by printing money or figuratively dropping it from helicopters – expanding their balance sheets in the process. They then remit any net interest from their trillions of dollars or Yen bond purchases right back to their treasuries. The money in essence is free of expense and free of repayment as long as the process continues uninterrupted. Technically, the central bank will argue, they have not allowed their treasuries to finance for free because they will sell the bonds back to the free market one day. Not a chance. The only way out for Japan for instance with 350% of debt to GDP and much of it owned by the BOJ is to extend and extend maturities at 0% interest until private markets catch on. Which frankly is what they want. Global markets wising up to the scheme will precipitate the sale of the remaining JGB’s, weaken the Yen and create their magical 2% inflation! Oh this sounds too good to be true. Just print the money! Well to be honest, a politician – and a central banker – should admit that increasing joblessness must be paid for somehow. Raising taxes (not lowering them, Donald) is one way. Issuing more and more debt via the private market is another (not a good idea either in this highly levered economy). A third way is to sell debt to central banks and have them finance it perpetually at low interest rates that are then remitted back to their treasuries. Money for free! Well not exactly. The Piper that has to be paid will likely be paid for in the form of higher inflation, but that of course is what the central banks claim they want.What they don’t want is to be messed with and to become a government agency by proxy, but that may just be the price they will pay for a civilized society that is quickly becoming less civilized due to robotization.There is a rude end to flying helicopters, but the alternative is an immediate visit to austerity rehab and an extended recession. I suspect politicians and central bankers will choose to fly, instead of die. Private banks can fail but a central bank that can print money acceptable to global commerce cannot. I have long argued that this is a Ponzi scheme and it is, yet we are approaching a point of no return with negative interest rates and QE purchases of corporate bonds and stock. Still, I believe that for now central banks will print more helicopter money via QE (perhaps even the U.S. in a year or so) and reluctantly accept their increasingly dependent role in fiscal policy. That would allow governments to focus on infrastructure, health care, and introduce Universal Basic Income for displaced workers amongst other increasing needs. It will also lead to a less independent central bank, and a more permanent mingling of fiscal and monetary policy that stealthily has been in effect for over 6 years now. Chair Yellen and others will be disheartened by this change in culture. Too bad. If there is an answer, the answer is that it’s just that way. 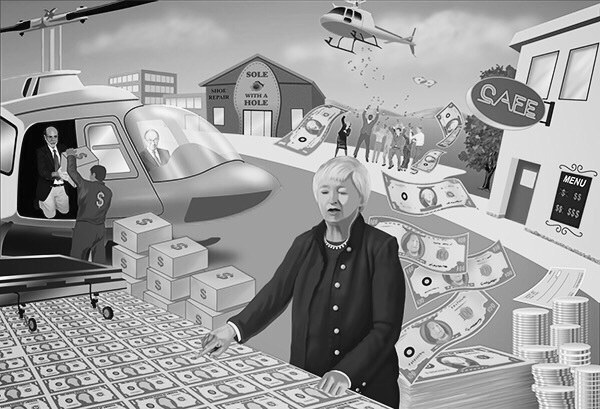 Investment implications: Prepare for renewed QE from the Fed. 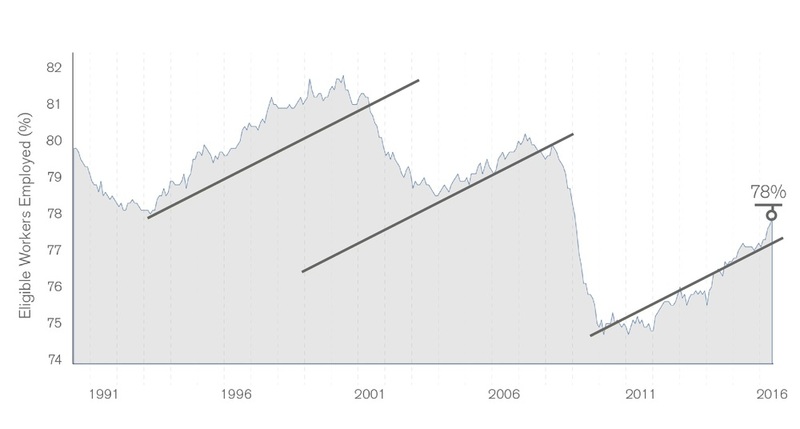 Interest rates will stay low for longer, asset prices will continue to be artificially high. At some point, monetary policy will create inflation and markets will be at risk. Not yet, but be careful in the interim. Be content with low single digit returns.